Kundalini is defined as the divine power shines like the stem of a lotus; like a snake, coiled round upon herself she holds her tail in her mouth and lies resting half asleep as the base of the body. Kundalini is an invisible force, but in the human body it is clothed in a nest of hollow concentric spheres of astral and etheric matter, one within the other. There are seven concentric spheres resting within the Root Chakra. In the ordinary human, the only force active is the outermost sphere; the other spheres are asleep. In order to bring your Root Chakra into full activity is to awaken these inner spheres, and it is this force that arouses or activates the rest of the chakras. Kundalini, the Supreme Force, which is lying dormant in the root chakra at the base of the spinal column, in the form of a serpent with three and a half inch coils. The kundalini power lies at rest at the lower end of the spine like a "coiled snake" and enters the system through the Root Chakra. The kundalini power flows through the sushumna in a mere trickle in most people. But when it is awakened, it rises up the sushumna like a growing stream, activating the chakras, supplying them with vibrations, causing them to expand and increase their vibrational frequency. As the kundalini rises, its energy is transformed into various vibrations, corresponding to each individual chakra. The degree of each chakra's performance is determined by the degree of consciousness the person has attained in the various areas of your life, and whether they are blocked by stress and unresolved experiences. The more conscious a person is, the more active and open their chakras will be and the more kundalini that will be able to enter their body and flow like a strong flowing stream. But there are various methods you can use to awaken the kundalini power. Some of these methods involve the use of your will, breathing exercises, mantras,& various postures . After awakening this Kundalini, you have to take this Power upward, through the Sushumna Nadi, from Root to crown Chakra. Then you will get various powers. Nadis or channels are the Astral tubes made up of astral matter that carry psychic currents. Since they are made up of subtle matter, they are not visible to the naked physical eye. It is through these Nadis that the vital force or Pranic current flows in the body. These Yoga Nadis are not the ordinary nerves, arteries and veins. Our body is filled with innumerable Nadis. There are about 3,50,000 Nadis in the body. Kundalini can be classified into three parts: the core, the fire, and the energy. 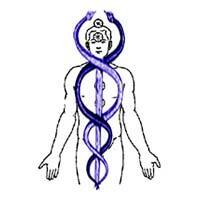 As in the figure, the core of the Kundalini is the Kundalini itself. The core of the Kundalini is the last part that moves. It can only move after the sushumna is open quite wide and is clean. The cleansing is actually done by the fire of the Kundalini. It is restless. Nobody should tamper or "experiment" with it without the instruction of a Master (Guru) who thoroughly understands the subject, because the dangers associated with it are very real and terribly serious.